Beyerdynamic Blue Byrd review | What Hi-Fi? The Beyerdynamic Soul Byrds are among the best sub-£100 wired in-ears we’ve reviewed recently, so by rights, a Bluetooth version of those five-star headphones - the Blue Byrds (see what they did there?) – should be a smash hit. But while the sound is as good as expected, the design of the Blue Byrds is decidedly disappointing. An awkward remote, short battery life and a neckband not fit for running or the gym see to that. The cabling on the Beyerdynamic Blue Byrds is the main issue. 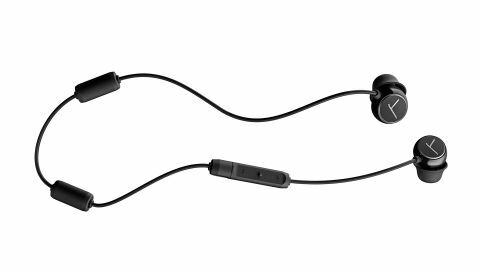 Neckband wireless earphones usually have a flexible ‘U’ band that sits around your neck and retains its shape, keeping the earphones in place while you walk or run. However, these Beyerdynamics have standard floppy cabling throughout, leaving the wire free to gradually slope off. The little plastic blocks placed at three points along the cable just aren’t enough to keep the earphones in place. Go for a run wearing the Beyerdynamic Blue Byrds and they end up dangling freely. It’s not a great outcome, and rules this pair out for regular exercise use. They are better when walking around, but also lack common extras such as magnetised earpieces, which would keep them from bouncing about when not in your ears. The oversized remote feels clunky, and its buttons seem cheap. For a pair of earphones costing over £100, it’s rather disappointing – even on lower-priced alternatives, such as the OnePlus Bullets Wireless or SoundMagic E11BTs, you’ll find a better standard of engineering. The only benefit to the Blue Byrds’ design is that you can easily stash them in your pocket. The other issue is battery life which, at six hours, is only marginally better than some true wireless pairs, which typically struggle comparatively for longevity. The Blue Byrds are embarrassed by rivals such as the SoundMagic E11BTs, which only lose 60 percent charge after 24 hours of non-stop playback. Judging by the size of the big plastic block that holds the Beyerdynamic Blue Byrds’ electronics, you’d assume they would at least reach the category standard of 8-10 hours. They do have a USB-C socket for charging, the same as recent Android phones, so you may well find you've got an abundance of necessary cables, which is always handy. The port isn't covered, though, and there’s no official water or sweat resistance rating either. While the hardware of the Beyerdynamics fails to match the level offered by many cheaper alternatives, their sound is very good indeed. They have the weight and power to appeal to the masses, and enough rhythmic drive and dynamic range to satisfy those who are expecting something resembling the sound from the company's ‘studio’ headphone range. Bass has enough heft and depth to help them compete with the ambient noise that is the constant annoying sidekick of a portable headphone, but it is paired with unusual poise and textural definition. This results in surprising clarity and resolution, without relying on the overt treble boost often used to make a pair of earphones appear more detailed than they really are. These earphones have a fair amount of treble energy, but not enough to give them a potentially off-putting bright signature. There’s a slight hint of artificiality to the upper frequencies, but it’s nothing to put you off when shopping in this class. Power and precision give the Blue Byrds a compelling character. They are bold and engaging, with unusually good separation for the price. Beyerdynamic has also made sure the focus on sound is not held back by the underlying tech. The Blue Byrds support the low latency aptX codec as well as the AAC used by Apple, and standard SBC. The Blue Byrds’ sound merits the price jump over the SoundMagic E11BTs. It’s just a shame that the practicality and ergonomics are of the league below. The Beyerdynamic Blue Byrds continue the sonic form of the excellent Soul Byrds, which is to say that they're great-sounding earphones. But unfortunately, other aspects are much weaker – the battery life is very disappointing, the neckband design is no good for any kind of active use (including a semi-trot to the bus), and the remote feels cheap and is awkwardly positioned. While sound clearly matters, it’s no use if the headphones are let down by practical matters, such as the earbuds falling out of your ears. Despite the Blue Byrds sounding great, their design shortcomings are impossible to ignore.